Painting the Revolution in Philadelphia. Great art sometimes comes in times of major stress. This show deals with a school of art that has been recently overlooked if not relegated to the dustbin of history. We need to look again, the curators show us. These pieces in this show were created during years of social upheaval and revolution in Mexico. Conflict can be a catalist for great painting. An example of this theory occuring at the same time but on the other side of the world, was the German Expressionism movement. These artists were were slathering right out of the tube paint over screaming black lines while being shot at, suffering nervous breakdowns and being imprisoned during both World Wars. Meanwhile, neutral Switzerland snoozed under a blanket of 500 years of peace, supplying the world with cuckoo clocks and boxed chocolate. We are taken aback at how modern it all looks. There is a refreshing lack of European compositional elements. Even with leaders like Porfirio Diaz sending many Mexican artists to Europe to try learn 'em up. The only klunkers are at the beginning of the show where the artists used old school compositional tricks of the trade. For example the golden section which serves to divide a painting into pleasing sections, often two thirds or two fifths. Typically a horizon line is employed or a figure stands exactly at this designated classical picture making proportion. Thankfully Mexican painters went their own way basing their art on experience and the tradition of folk art. This Diego Rivera drawing looks fresh. We would not be surprised to find it on a mural in East LA or the cover of Juxtapoz magazine. It's from 1938. Inconceivable that this painting, Zapatistas by Alfredo Ramos Martinez, could by a French Impressionist. Flat, graphic and patterened, it stands up to today's aesthetics of design. The total lack of any perspective brings you right into the close quarters and the resolve of troops ready for battle. The one guy without a hat is a brilliant touch. This grisly image was painted on the spot by Goita, an illustrator in Pancho Villa's army. He recorded the horrors of the Mexican Revolution in the summer of 1914. Communicates as well as a Goya. We like the owls. Art for the people, these paintings cry! Enough of the bourgeois with their materialistic values and conventional attitudes. This show brings these brilliant painters together maybe in in all encompsing show for the first time? Clear out ideas of the cliched ol' south of the border art. Drop everything take the bus or drive. Watch the local area parking fees ($55) and don't stay at the Logan Hotel - where we were interupted in the middle of the night by an employee with a pass key wandering about. "Oh, that was just Eddie, will somebody please tell him stop doing that, again?" Said the lady at the front desk. 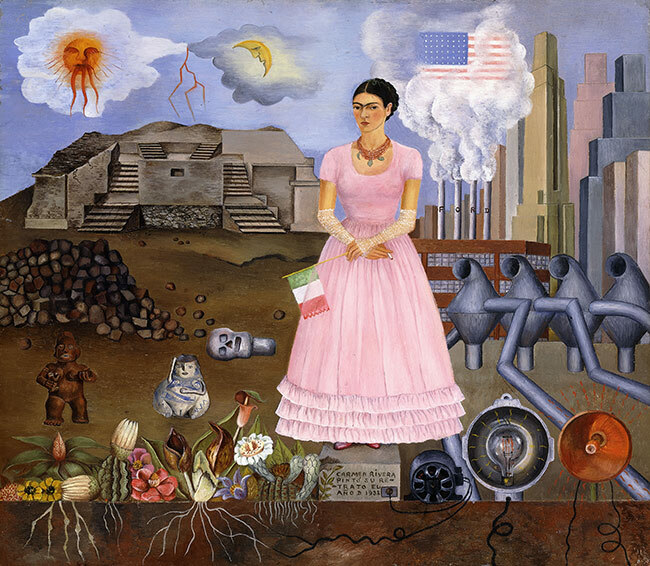 From the start of the Mexican Revolution to the aftermath of World War II, artists and intellectuals in Mexico were at the center of a great debate about their country’s destiny. The exhibition tells the story of this exhilarating period through a remarkable range of images, from masterpieces by Diego Rivera, José Clemente Orozco, David Alfaro Siqueiros, Frida Kahlo, and Rufino Tamayo to transfixing works by their contemporaries Dr. Atl, María Izquierdo, Roberto Montenegro, Carlos Mérida, Manuel Álvarez Bravo, and many others.